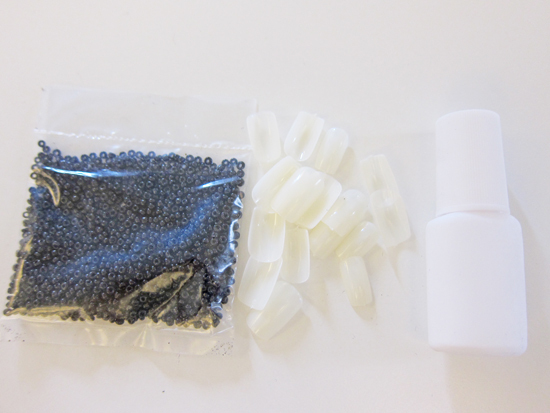 Basically, you just sprinkle beads all over some wet nail polish and let it dry or buy a "Caviar" manicure kit, offered in three colors: black, white, and multi. This textured manicure is supposed to be reminiscent of the ultimate in luxury, as if ultra-expensive Beluga caviar has been spread across your fingertips. But you don't have to be the girlfriend of a Russian ruler to get the look. You can recreate the manicure for almost nothing. 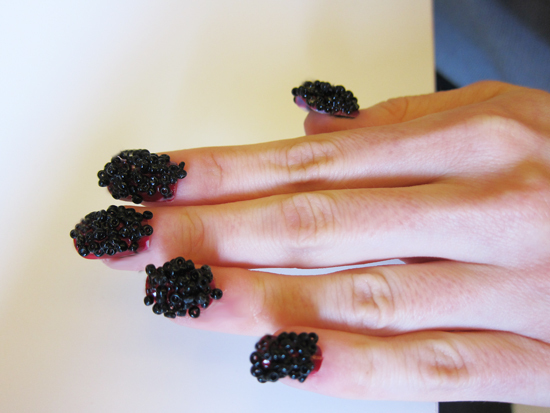 To create the caviar manicure, you'll need some inexpensive press-on nails (you don't want to do this on your natural nail bed, believe me), a packet of small black beads from Spotlight or Lincraft and some maximum-hold nail glue. Because the fake nails are white, use a little nail polish to keep the manicure from looking see-through, since the beads can't cover every little bit of nail. After the paint dried, drip a generous portion of nail glue onto each nail and then flip them over into a pile of the beads. Leave them on the bead pile for about 30 seconds (the amount of time it takes nail glue to set), then pick them up, apply more glue and repeat this step until you get the coverage you want. Note: If you don't want nail glue all over your fingers, use a pair of tweezers to do this. 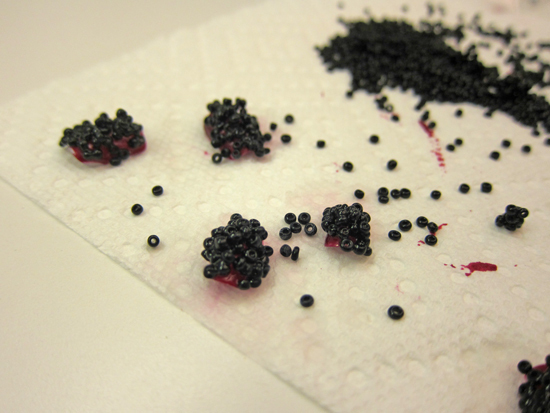 Tweezers are also great for placing beads in any empty spots you might have missed. 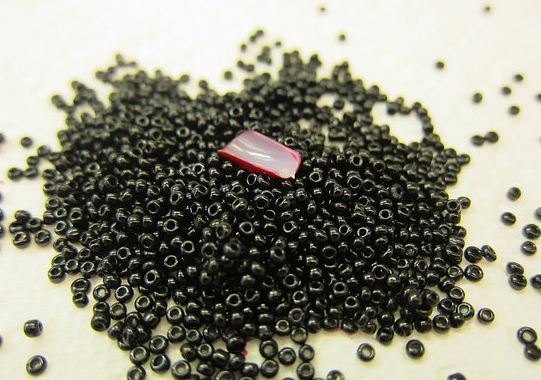 Once we had all the beads in place, we wanted to give the nails more of a three-dimensional caviar-like look. 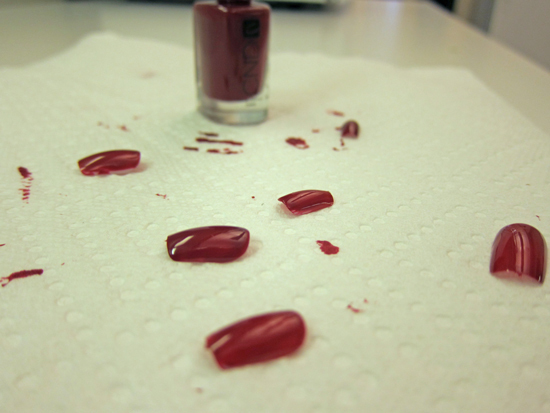 To do this, let them dry, then drop several more coats of nail glue on top to bond them together. Make sure you put a plate or a couple of layers of paper towels under the nails to avoid spilling glue on all your surfaces. To finish, swipe a shiny topcoat on to give your nails a "wet" caviar appearance. Then, just press the nails onto your nail beds. The beads stayed on very well because of the nail glue's strength, and although we wouldn't recommend trying to open a soft drink can while wearing them, for a night out, they should definitely hold together. What we'd do differently next time: While the larger beads I used are great for demonstration purposes, you'll probably be happier using smaller seed beads. I'd also recommend making the nails shorter for real-life wear for something a little more subtle.